Liverpool's lack of a cutting edge was further exposed by a determined Charlton at Anfield. The Reds dominated but were frustrated through a combination of poor finishing and inspired keeping by Thomas Myhre. Myhre was at his acrobatic best as he saved an attempted clearance from team-mate Hermann Hreidarsson before a sprawling save to deny Djibril Cisse. Robbie Fowler thought he had scored a late Reds winner but the goal was ruled out, with Cisse straying offside. The match had unravelled into an all-too familiar story for Liverpool as they quickly took a stranglehold of the game but failed to turn their dominance into goals. There was an unerring similarity to Charlton's 2-0 win over the Reds just under a month ago when the home side applied plenty of pressure but paid the price for wasting their chances. Charlton were given an early scare when defender Hreidarsson almost steered a Steven Gerrard cross into his own net only for Myhre to fingertip the ball wide. The visitors were frustrating the Anfield side with their discipline and organisation in defence. And the Addicks' attitude was encapsulated when Harry Kewell had a sight of goal blocked by two lunging defenders. The Reds picked up the pace as towards the end of the first half and Myhre was again Charlton's saviour as he twice denied Cisse. The Norwegian keeper produced a full-length dive to turn Cisse's far-post header around the post and then saved a well-struck shot by the striker. Charlton continued to hold Liverpool at bay after the break in a manner too comfortable for the anxious home crowd. A chance did materialise when Cisse found Peter Crouch with a cross only for the striker to head tamely at Myhre. 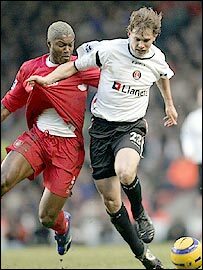 Charlton almost made Liverpool pay the penalty for their profligacy but Jason Euell shot wide late on. Fowler looked to have grabbed a last-gasp winner when he controlled Steven Gerrard's miscued strike and drove home a shot. But a debatable decision denied him a goal with Cisse being ruled offside. The point lifted Liverpool to second in the Premiership but they have played two games more than third-placed Manchester United. "It is a pity in the last games we are not scoring goals. We are doing everything to score and are creating a lot of chances. "The goalkeeper of the other side is always man-of-the-match but we just have to keep going. "I saw the flag but Robbie was on-side. I don't want to blame the official as the most important thing is that we need to score during the 90m minutes with the number of chances we create." "I'm delighted. We won five away on the spin at the start of the season which was because we kept clean sheets. "Since then - until the game against Newcastle and here - we have not kept a clean sheet. "We've had to do something about it and I know it's not been pretty but we've had to work ever so hard." Liverpool: Reina, Kromkamp, Carragher, Hyypia (Riise 45), Traore, Cisse, Hamann (Alonso 73), Gerrard, Kewell, Crouch (Morientes 80), Fowler. Subs Not Used: Dudek, Finnan. Charlton: Myhre, Young, Perry, Hreidarsson, Spector, Ambrose (Powell 87), Kishishev (Euell 77), Holland, Hughes, Darren Bent, Marcus Bent (Bothroyd 53). Subs Not Used: Andersen, Thomas.